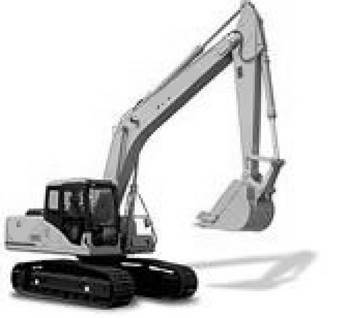 Hydraulic excavators are designed to excavate below the ground surface on which the machine rests. These machines have good mobility and are excellent for general-purpose work, such as excavating trenches and pits. Because of the hydraulic action of their stick and bucket cylinders, they exert positive forces crowding the bucket into the material to be excavated. The major components of the hydraulic hoe are the boom, the stick (arm), and the bucket. Fast-acting, variable-flow hydraulic systems and easy-to-operate controls give hydraulic excavators high implement speed and breakout force to excavate a variety of materials. The hydraulic hoe is ideal for excavating below the ground’s surface on which the machine rests. A large variety of booms, sticks, buckets, and attachments give these excavators the versatility to excavate trenches, load trucks, clean ditches, break up concrete, and install pipes. The hoe is normally associated with two types of excavations¾trenching (linear-type) and basement (area-type). The operator should judge the length and depth of cut to produce a full bucket with every pass (Figure 5-3). 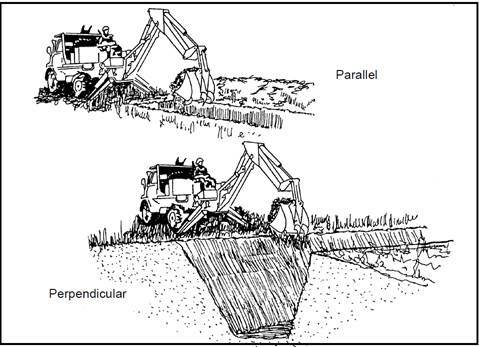 Figure 5-4 shows parallel and perpendicular trenching using hoe attachment. With the parallel method, center the hoe on the trench, while keeping the tractor in line with the trench center line. As the digging progresses, move the machine away from the excavation and load the material into haul units or stockpile it along the side of the trench for later use as backfill. 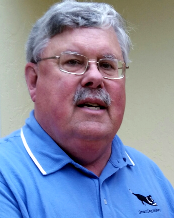 When using the perpendicular method, dig the trenches in two or more cuts or lifts. To excavate the top 35 to 45 percent of the trench depth, make the first cut with the boom carried high. To finish the cut and remove the remainder of the material, move forward about one-half the length of the machine with the boom carried low. 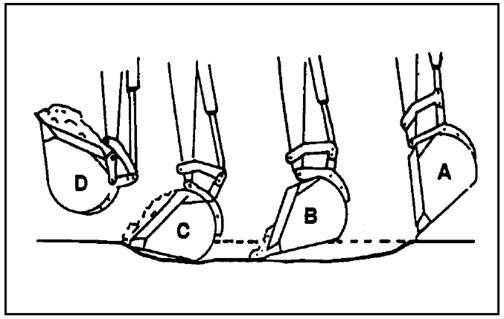 Although this method involves more and shorter moves, it has better bucket digging angles and shorter hoisting distance on the top lifts. Many variations of the two excavation sequences shown in Figure 5-5 are possible. The procedures vary with the design and shape of the excavation, the restrictions of surrounding properties, and the requirements for disposing of the spoil. The first cut is a trench with vertical outside walls. To minimize handwork or cleanup, dig all outside wall faces vertically. Plan the starting point and the digging sequence so that the machine conveniently works itself out of the excavation. Dig trenches for service pipes last; dig them from the basement outward. Straddle the machine over the outer edge and dig over the end and side of the tractor. Move the machine as the arrows in the figure indicate. Survey the area for underground hazards as well as for surface obstacles before digging. This applies particularly to populated areas with multiple underground utilities. Working in confined quarters is not efficient from a production standpoint. If expecting considerable close-quarter work, plan to use small machines that can operate efficiently with a minimum work radius. If the job is to continue during wet seasons or in wet areas, give prime consideration to drainage. Begin ditch excavations at the lower end and work toward the upgrade. A hoe will dig into fairly hard materials. However, blasting or ripping may be more efficient than breaking through hardpan and rock strata with the bucket. Once the trench is open, break the ledge rock by pulling the bucket up under the layers. Remove the top layers first, lifting only one or two layers at a time. 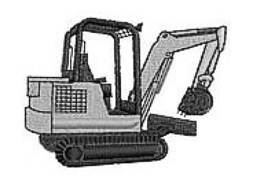 A small excavator is generally a lightweight, skid-steer, diesel-engine, high-mobility machine. It is equipped with a hoe, a loader bucket, and other hydraulic attachments. 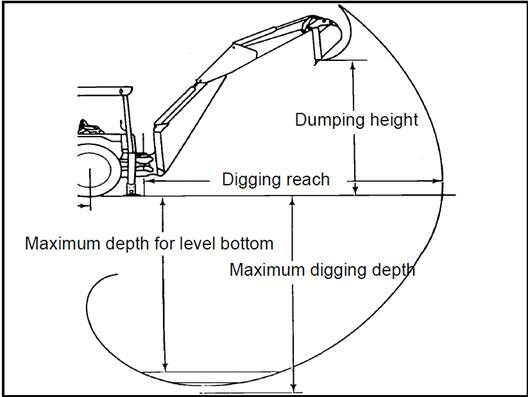 Track-mounted excavators (Figure 5-6) are diesel-engine machines that have a maximum digging depth of approximately 20 feet and an approximate dumping height of 22 feet. These excavators can travel around a job site at a maximum speed of about 3 mph in high range. They must be transported for long-distance travel between projects. They are used for excavating pipeline trenches, drainage ditches, building footings, and hasty fortifications and for loading trucks. An excavation cycle consists of loading the bucket, swinging the loaded bucket, dumping the bucket, and swinging the empty bucket. Average conditions would be a depth of cut between 40 and 60 percent of the machines rated maximum digging depth and a swing angle of between 30° to 60°. Greater digging depths or swing angles increase the cycle time. Make sure the hoe is level before operating. Lower the front loader bucket to the ground (flat) so that the machine’s front wheels are not in contact with the surface. Move the gearshift and the range-shift levers to their neutral positions, and lower the outriggers. Use the outriggers to level the machine and to raise the rear wheels slightly above the ground. Always operate with the least amount of bucket-arm swing. 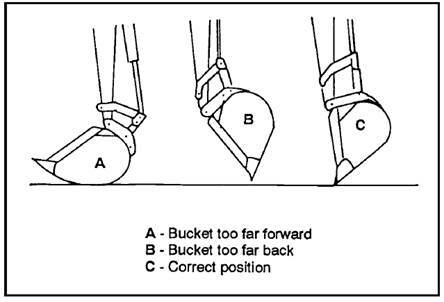 For evaluating heaped capacity, hoe buckets are rated with an assumed material repose angle of 1:1. Therefore, actual bucket capacity depends on the type of material being excavated as all materials have their own natural repose angle. Table 5-1 provides bucket fill factors for hoe buckets based on material type. Cyle time is mostly dependent on size of bucket, which idefines swing radius. direction (minimum travel), and dump. Step 1. Put pressure on the boom to force the bucket teeth or cutting edge into the ground. Step 2. Roll the bucket toward the machine until it is full. Step 3. Raise the bucket, in a smooth operation, high enough above the trench to clear the spoil pile or the hauling unit, and dump the excavated material. Stick Cylinder. The maximum digging force is developed by operating the stick cylinder perpendicular to the stick. As a rule, the optimum depth of cut for a hoe is 30 to 60 percent of the machine’s maximum digging depth (Figure 5-3). 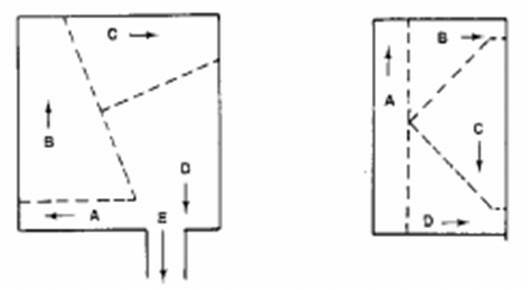 When using the stick cylinder to excavate, follow these steps: (Figure 5-8). Use the bucket cylinders to help break the ground loose instead of depending on the forward movement of the machine, as in the loader crowding technique. Do not raise the bucket higher than necessary to dump the material. Use as flat a ramp as possible when starting an excavation. Plan the job so that most of the hauling from the excavation can be done when driving the unit forward. A steeper ramp can be used when driving forward than when driving in reverse. Keep the working area level. Plan and lay out the area of operation. Rotate the bucket over the rear of the dump bed, rather than over the cab of the truck. Keep the working area smooth. Raise the bucket while moving toward the truck. Lower the bucket while moving away from the truck. Shake the bucket only when necessary to loosen dirt stuck in the bottom of the bucket. Position the machine at approximately a 45° angle to the length of the trench and its spoil pile. With the bucket raised about 2 inches above the natural ground, use it like a dozer blade to push the material into the trench. Keep the bucket level while pushing the material; do not crowd/curl. After the material falls into the trench, reverse the machine and move along the pile to repeat pushing. After the last pass, dump the material remaining in the bucket into the trench. If the material in the spoil pile along the trench is higher than 2 feet or is wet, attack the pile in two passes. Take off the upper half with the first pass and the remainder with a second cleanup pass. On utility jobs the excavator many need to lift and swing heavy sections of pipe into a trench. Sometimes these machines are used to hoist and unload materials from trucks. The weight an excavator can lift depends on the distance the load is from the center of gravity of the machine. Always refer to the current specification sheets before attempting a lift. Position the machine as close to the load as possible. The other critical element to consider is swing and position. The lifting capability is 65 to 70 percent greater over the front of the machine than over the side. These machines are designed to handle 15,000 pounds (at a swing radius of 15 feet) over the side. Working radius for digging and dumping. Use a hoe equipped with a 0.25-cubic-yard bucket to excavate hard clay. The depth of cut will average about 50 percent of the machine’s maximum digging depth and the swing angle should be less than 60°. What is the expected production, in BCY per hour, assuming 50 working minutes per hour? Step 1. Determine the bucket fill factor based on the material type (Table 5-1). Lacking any other information, use an average of 0.85 (85 %). Step 2. Use a hoe cycle time based on past performance data if available or use the average cycle time from Table 5-2. Step 3. Determine the ideal production rate (LCY per hour). Step 4. Determine the production rate (LCY per hour) by adjusting for efficiency. Step 5. Convert the production rate from LCY per hour to BCY per hour. Determine the soil-volume correction factor from Table 1-2.